Little Buddy and I had an action packed day today. We started off at his gardening club. He attends on Saturdays in the Fall and Spring, it is to help with socializing and gives him something very fun to do. After that we went directly to an open house at one of our local fire departments. It was so much fun. He had to walk a long way to get to the firehouse and it is super warm out so that was the only draw back of our adventure. 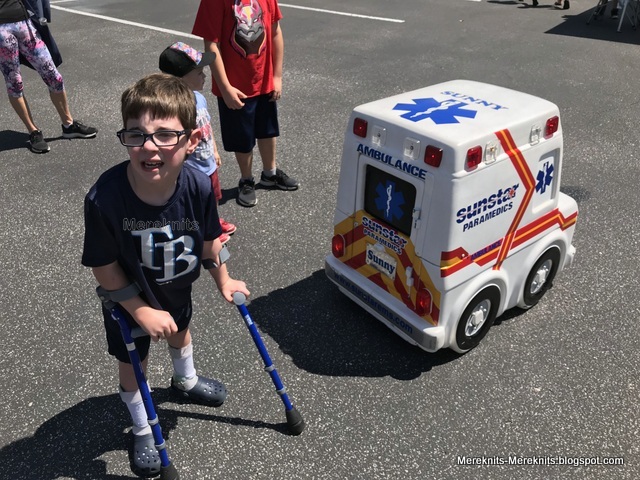 While we were there he got in an ambulance, looked at different types of firetrucks and rescue vehicles, and saw this wonderful remote control ambulance. He could not figure out how it moved! We also got to see the Bay Flight ambulance/helicopter. It is teeny tiny my friends. You can barely move in it. Little B was about as tall as the compartment they treat the patients in. Right after we looked inside it they had a call to go rescue someone. It was exciting to see it take off and get to work. 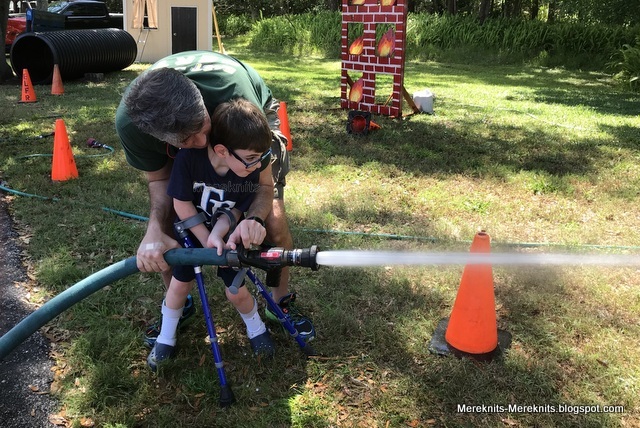 There were wonderful volunteers that helped the little ones do all kinds of things including spray water with the fire hose. One of the firefighters that works in the woods and on the lakes and rivers brought his boat and a friend to pet. I am not sure this little alligator was all too pleased with the attention. 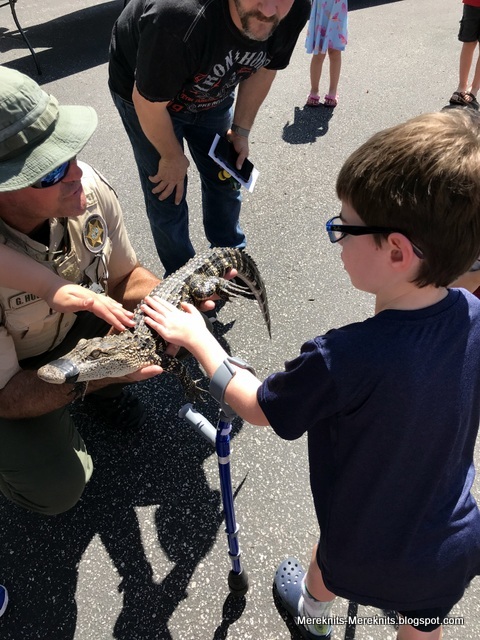 The young man holding her kept saying never pet an alligator in the wild. No worries there, even though they live behind my house in a little creek area. I stay away from all alligators! After this excursion we went to my dear friends open house at her business. It was technically her grand opening although her store has been up and running for several months. We talked to a good friend of hers who works with elevators. He was amazed at Little B's elevator knowledge. He showed Little Buddy all sorts of photos of hydraulics engines, cables and such. Little Buddy was in heaven. Little B even identified an elevator by the control panel even though there was no name anywhere in the photo. Let me just say Mr Mike was completely amazed. He offered Little Buddy a job as a sales rep. Now my very busy little elevator man is taking a rest so I can write this post. I have another finish my friends. My second Slouchy Crochet Cardigan is officially done. I finished it this morning and I am so excited with it. I started this back in December and then had to stop working on it to make all those baby blankets. It would have been done earlier this week except I had to completely redo the second sleeve. You see I knew I was off count yet continued to keep crocheting, not listening to the voice in my head that told me to stop. I mean who listens to that voice when they can keep crocheting in denial somehow hoping it would all work out. I ended up with three extra stitches per row, times 40 rows which makes about 120 extra stitches. Believe me when I say a sleeve can not handle 120 extra stitches. I ripped it all out and started again. And wouldn't you know when you count correctly the sleeves actually match! 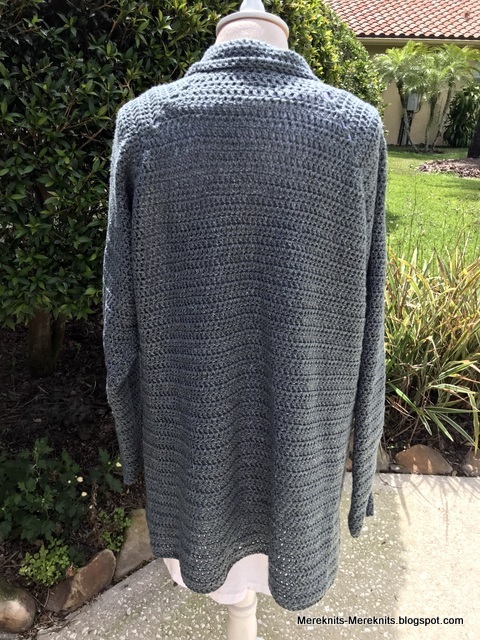 Made with Jeans by Lion Brand Yarn in the color Vintage. It was the only color that my local Joann's had seven skeins of. You know me I am a gray fanatic so now I have a lighter gray and a darker gray in this same sweater pattern. I used almost all the yarn in my seven skeins, minus what you see below. The little ball is the difference 120 stitches makes in a sleeve. It was what was left over when I made the sleeve correctly. I used a size J hook to make this sweater and that is that! I love it, it fits, it is big and snugly as it is 100% acrylic, not something I usually use but it worked for this. And now that it is 86 degrees out today I will put it away for cooler weather sometime in the very late Fall. 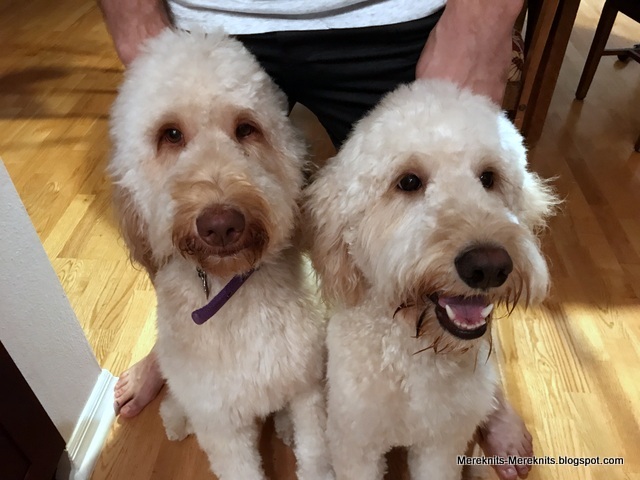 I wanted you to see the boys all freshly bathed with their haircuts. 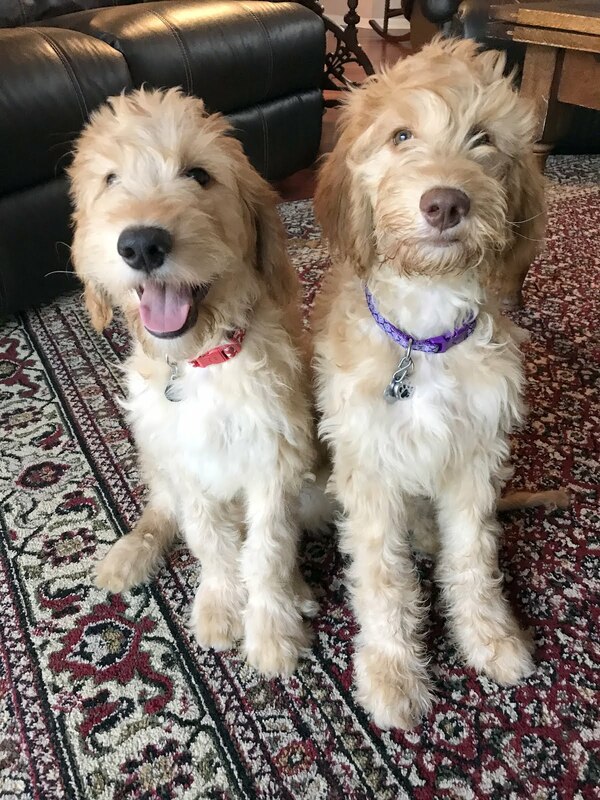 This photo was taken after I got them home last Saturday. They are looking much more curly and out of control now. They smelled so wonderful and were clean for about one night, by the next day they were back to normal. Ah well, I enjoyed their soft, fluffy bodies for a short time anyway. Hope you all had a wonderful week. Stay well my friends. Gardening club. 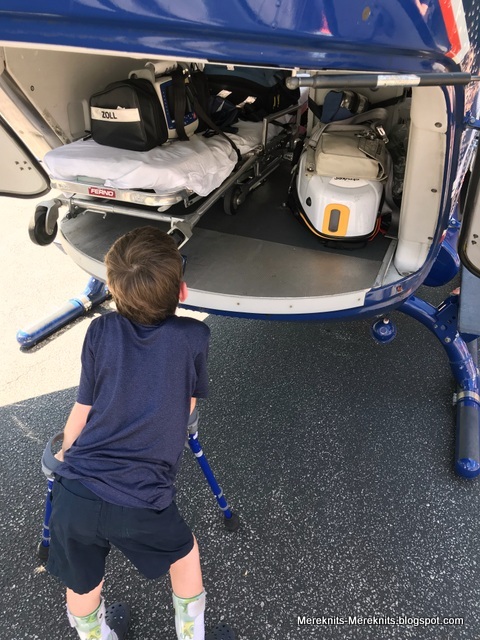 Great Firemen adventures - that rescue helicopter is really a tight fit - double the interest because he got to see it leave on a rescue mission. For a little guy who loves vehicles and guy stuff it was a great outing. 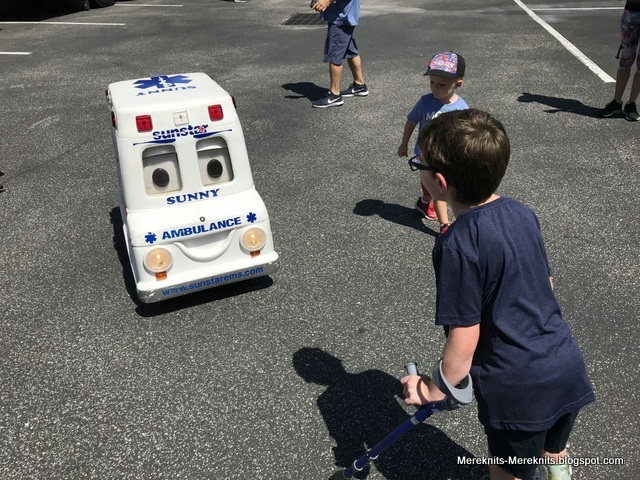 The Sunstar Sunny Ambulance sure drew the interest of the kids/and using a firehose - bonus. Then more guy talk about elevators - Little B def. had the best activity day outing. Your Cardigan looks cozy, slouchy and just right Meredith. Glad you included the 'boys' all fresh with their baths and haircuts. Something to remind you when they are enjoying their mischiefs. They look 'smaller' with their grooming. What an action packed day!!! Love the new cardi. I do love a good slouch. The boys looks so fresh. I was just thinking about taking Pup for a trip to a groomer. I do such a terrible job and I am such a sissy when it comes to her nails. This is a great finish. Loved this post - what a happy day for little Buddy. The two fur boys look so lovely. Love your new cardi too. Great cardigan! Some acrylics can be quite nice to work with, and they are usually very affordable. "even though they live behind my house in a little creek area. I stay away from all alligators!" frankly for this weeny just the thought of them living anywhere NEAR my house would scare me to pieces! LOL. your long cardi is so beautiful. I love clean and simple. elegant coziness! just like you and your home. have a wonderful week ahead. xoxo hug the fur boys for me. Wow! Y'all had a Very busy, fun filled day! 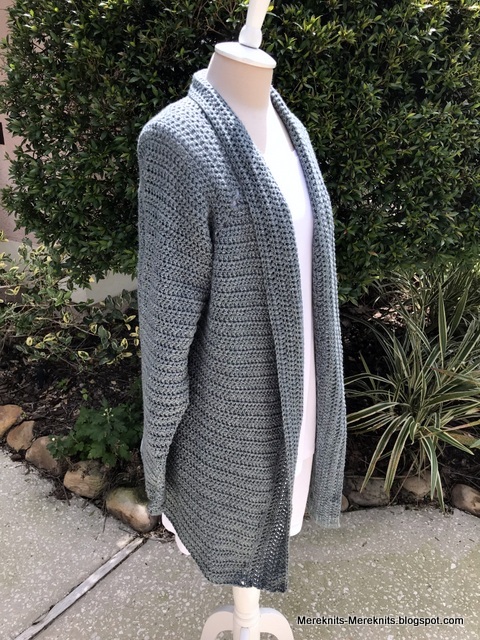 Love the cardigan and there is nothing wrong with having multiple gray sweaters! Little Buddy is very smart. Im so glad the fire department made him happy! It does for most little boys! Seeing the helicopter take off must have been fun! Our friend Ginny does flight of life and I don't know how she can stand the clostraphobic conditions and the flights. God Bless her. Sounds like a perfect day, just the kind that my youngest grandson would love, too. What a beautiful cardigan! It amazes me that you find time to crochet and knit with your busy schedule. Way to go! Gardening is good for the soul. We used to have a school garden before it had to make way for new classrooms. Such a shame, gardening club was really fun for the children. Your cardigan looks lovely. Grey is a perfect cardigan colour if you ask me. It goes with just about everything. I have several grey ones (but only made one). Terrific finish on that cardigan. It's absolutely lovely. It looks very comfy and stylish. It's funny what kids will get obsessed with and interested in, isn't it? Love your sweater, what a great finish. Glad Little Buddy had fun at the fire station, those trips are always a kid pleaser! 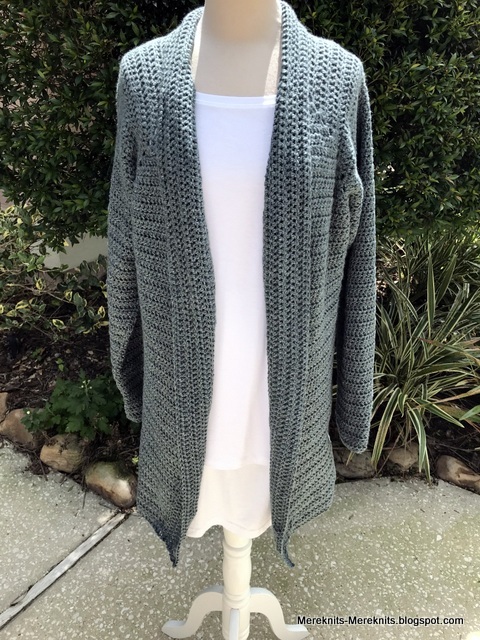 Lovely cardigan you finished I love the style and color. Looks like you had an action packed day and Buddy had fun. The pups look so clean and fluffy so cute! Great post. Buddy has really had some good experiences there. The pups look adorable. When Seth was about 4, we arranged a visit to a fire station. Seth was so awed, he just stood there with his mouth open. We couldn't get him to climb onto the truck! I absolutely love that sweater. And who can have too much gray in their wardrobe? You are such a good Mama, keeping your little guy so busy. 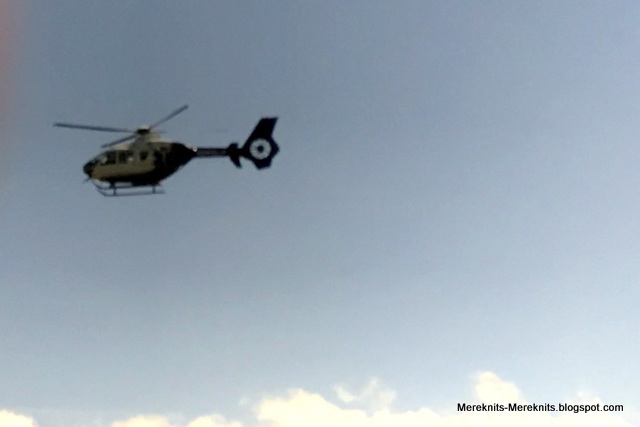 I love that the helicopter took off while you were right there and could see it all. The volunteers looked like they had as much fun as the kids. I would NEVER pet an alligator, even with it's mouth taped! LB is very brave. And I'm very impressed at his elevator knowledge. He'll be supporting you soon! Ha! Have a lovely week Meredith. Buddy had a big day for sure. Something I'm sure he'll remember with great fondness. Whew...I was tired though listening to all you did in a day. No wonder he was popped, lol. Your sweater is fantastic. Sounds pretty heavy though using WW yarn. 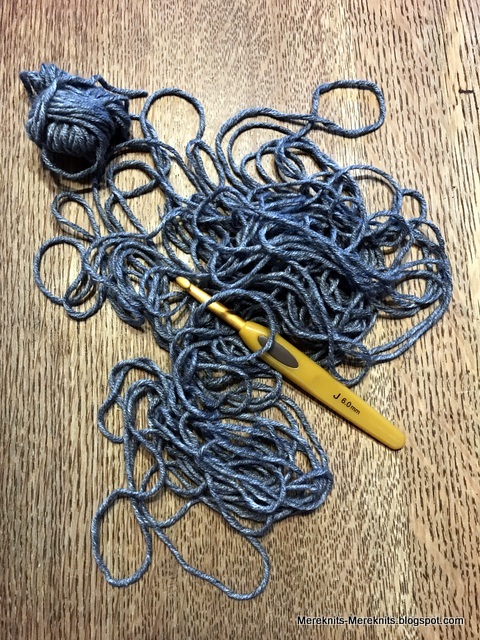 Wondering how hard it would be to substitute lighter weight yarn and adjust the gauge to still get the correct size...may have to go read the pattern you used and think about it. Congrats on getting it done, looks wonderful. Congratulations on winning the Yarn Chicken game for another cardigan finish - it looks lovely and cosy, just right to keep out a breezy chill. That big day with the emergency vehicles is a great leaerning opportunity for a young person like LB. Funny how the little ones get obsessed with things - For LB it's elevators (we call them 'lifts' here) while for a friend's little one it's a fascination with rubbish trucks! Here's a thought - One used to be able to get multistorey carparks for toy cars and trucks. I have seen ones that have little wind-up elevators to get the cars from one level to the next.